Iberia bridge between continents. We are in 1850, and a connection between France and Algeria is required for transporting oil. Yet we first must build a railroad that loops through the Iberian peninsula. In the first phase you have to connect four cities, namely, Madrid, Lisbon, Barcelona and Bordeaux. Then create two food companies and transport the resulting food. In the second phase we must transport: vehicles from Barcelona, oil from Brest, Brest manufactured goods from Cadiz, and paper from Alicante to Santigo newspaper. 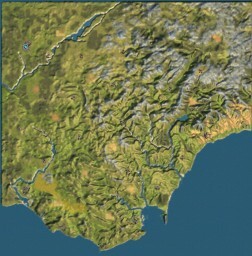 You must connect all cities in Africa and cities in northen Iberia: Gijon, Santander and Biarritz. Transport passengers Gijon-Biarritz, and Ouazzane-Barcelona and Argel-Lyon. Transport food from Ouazzane to Oran, Tiaret and Argel. Make Argel a Metropolis. Money: Net worth 75.000.000 pta and 100% share of your company.